As sad as it is, summer has come and gone. But with the fading heat and shorter days come the changing leaves and cool breezes of autumn. Welcome the new season by gathering your friends on September 23 to celebrate the first day of fall with these cocktail recipes from Baileys Original Irish Cream, Ketel One Vodka and Moon Mountain Vodka. Note: These recipes are for adults age 21 years of age and older! 1. 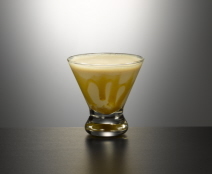 Swirl caramel around the inside of a martini glass and put to side. 2. Pour Baileys Irish Cream with a hint of Caramel, Ketel One, Ice and Espresso into a shaker and shake until very frothy. 3. Strain into Caramel swirled martini glass, making sure that the foam is on top to make it look like a cappuccino. Using a spoon while pouring helps keep the foam on top. 1. Measure the Moon Mountain Vodka, Cranberry Syrup including a few of the berries, lemon juice and orange juice into a cocktail shaker. 2. Fill with ice and add the bitters. 3. Shake vigorously and pour into a tall glass. 1. Place ingredients into a small saucepan. 2. Bring to a simmer over medium-high heat. 3. Simmer for 1 minute then turn off heat. Disclosure: These recipes were given to me by Hunter PR to share with all of my blog readers. Thanks for your recipe contribution!